Unusual, easy to prepare and very tasty Taiwanese dish. 2 cups of rice; 3 eggs; 2 tbsp. 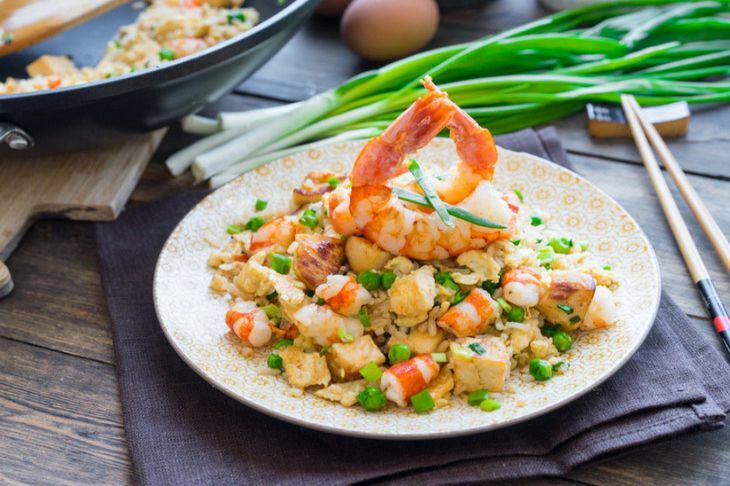 l. milk (can be replaced with water); 1 cup of frozen green peas (can be replaced with can); 10 large shrimps; 3 cloves of garlic; 1 bunch of green onions; 5 tbsp. l soy sauce salt, vegetable oil – to taste. Cook until boiled separate rice and shrimp. Mix the eggs with the milk and quickly rise with vegetable oil in a very hot frying pan with constant stirring. The omelette had to break into small pieces. Remove from heat, allow to cool. Fry the finely chopped or grated carrots in a frying pan for a few minutes, adding the green peas, shrimp, garlic and finely chopped green onions. Step for a short period, constantly stirring. Add rice to the pulp, add salt, add soy sauce and stir again. Keep on fire for approx. 5 minutes and add the omelet slices to the dish.